Last year, we published a photo essay about Marion’s “ruins”, and the post garnered so much interest that we’ve decided to do a follow up photo essay. You may have driven past some of these places dozens of times and never known that they represent interesting bits of Marion’s history. Other places, while not necessarily historically significant, have achieved a certain sort of local notoriety simply because their decrepitude has made them hard to miss. 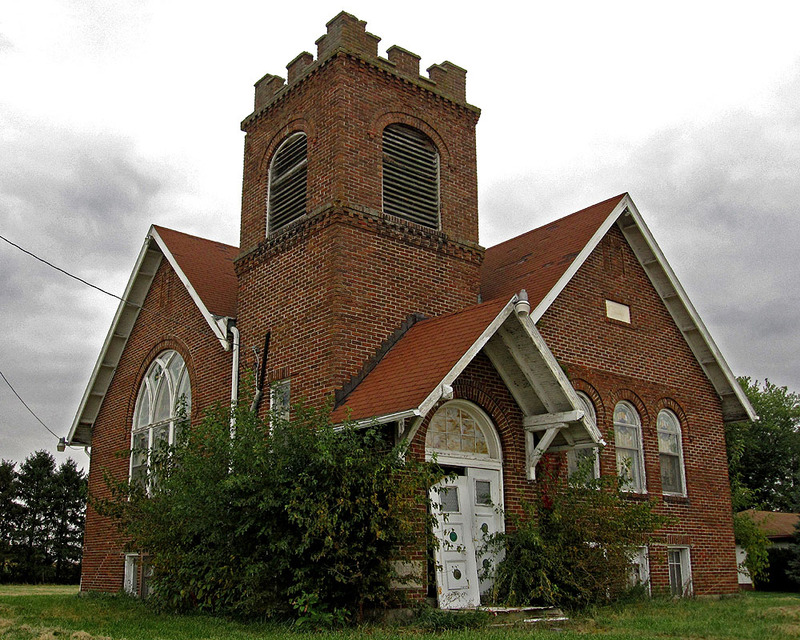 Although many of these buildings, churches and houses scattered around Marion County are probably beyond saving (and some, truth be told, shouldn’t be saved), we believe that these places as well as the stories that often go with them offer a unique take on Marion County. 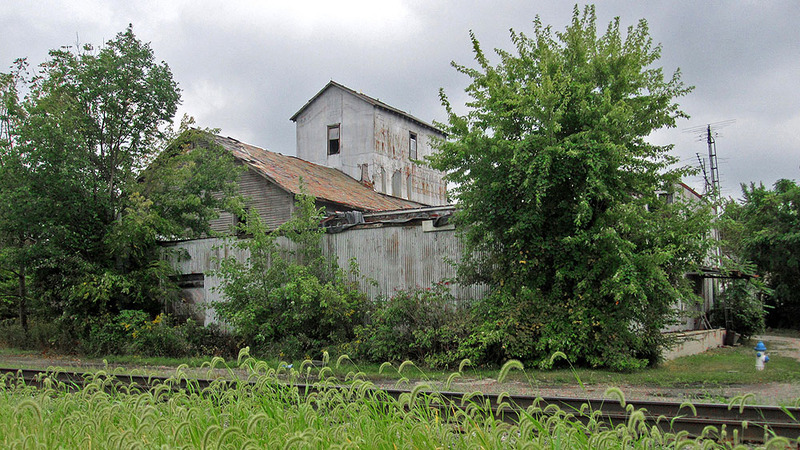 The Marion Brewing and Bottling Company was located on Bellfontaine Avenue between the railroad tracks. 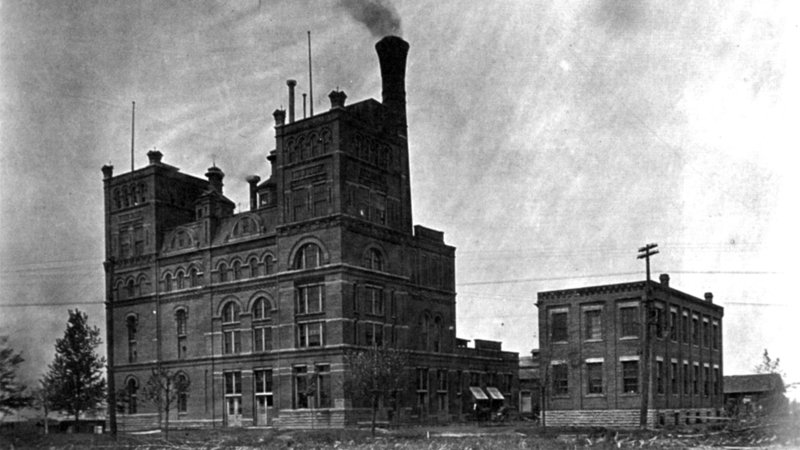 The Leffler and Bland Company – the same company that erected the Marion County courthouse – began construction in 1895, and the brewery began selling its beer early the following year. For almost 25 years, the brewery did brisk business in and around Marion. However, with the passage of state and federal prohibition acts, the brewery was out of business by the beginning of the 1920s. From the late 1930s until the 1970s, the Betty Zane company produced popcorn products in the old brewery. After Betty Zane ceased production, the building fell into disuse, and in 1980 the main building was demolished. A more complete story of the Marion Brewing and Bottling Company can be found here. Photo courtesy of Larry Henne. 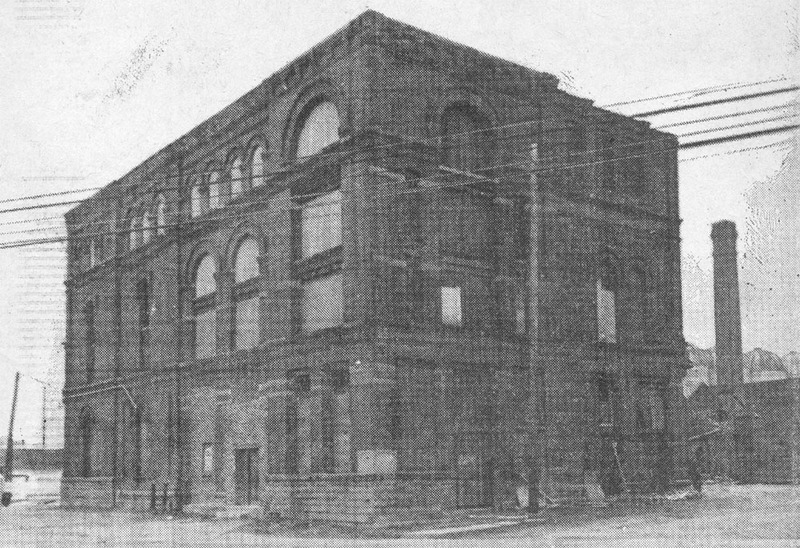 This photo, which appeared in the February 18th, 1980, edition of The Marion Star, shows the former Marion Brewing and Bottling Company building (minus the upper portions) shortly before it was razed. This building, now used for storage, is one of the few remaining buildings which were once part of the Marion Brewing and Bottling Company. 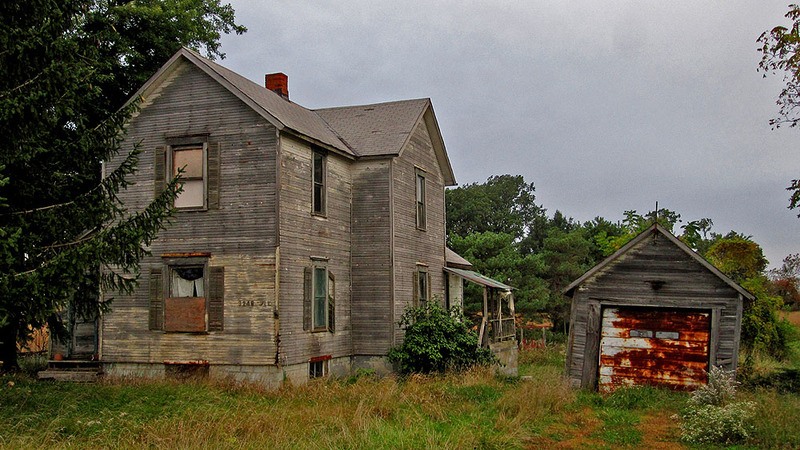 An forlorn-looking house on one of Marion County’s busiest roads, Harding Highway East. 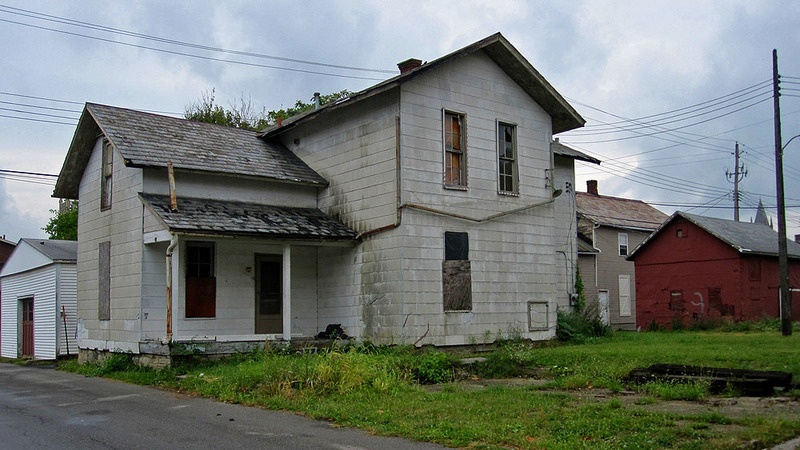 This seemingly unremarkable and derelict house located behind the old Sawyer Sanatorium (now Elite Apartments) actually represents an interesting little piece of Marion history. According to local historian Stuart Haley, this house once belonged to Charles and Mae Sawyer and pre-dates the Civil War. For those who don’t know, Dr. Sawyer was Warren G. Harding’s personal physician, both before and during Harding’s presidency. Sawyer is also somewhat notorious for his misdiagnosis of the coronary condition that eventually led to the President’s death in San Francisco in 1923. 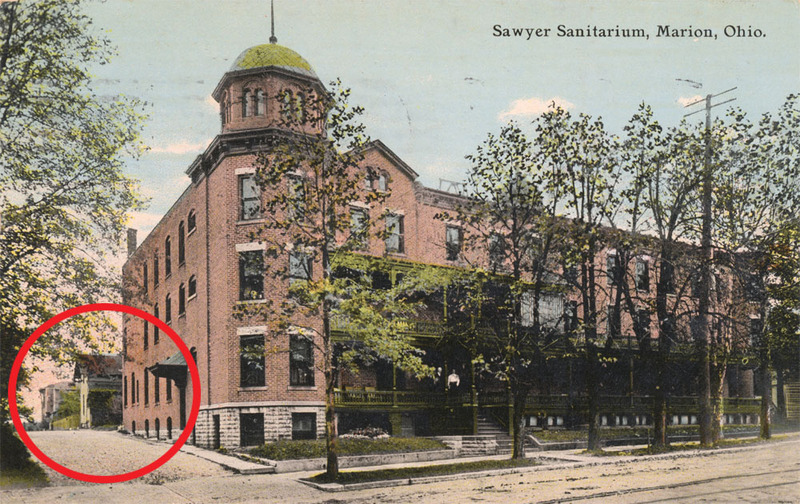 Patients who were suffering from physical and emotional maladies were treated at Dr. Sawyer’s sanatorium on South Main Street. In this old postcard, Dr. Sawyer’s house is clearly visible at the back. Interestingly, the house originally faced Main Street but was moved to it’s present location around 1901 to accommodate the sanatorium’s expansion. This postcard is courtesy of Mike Crane, who has a very cool collection of old Marion photos and postcards. 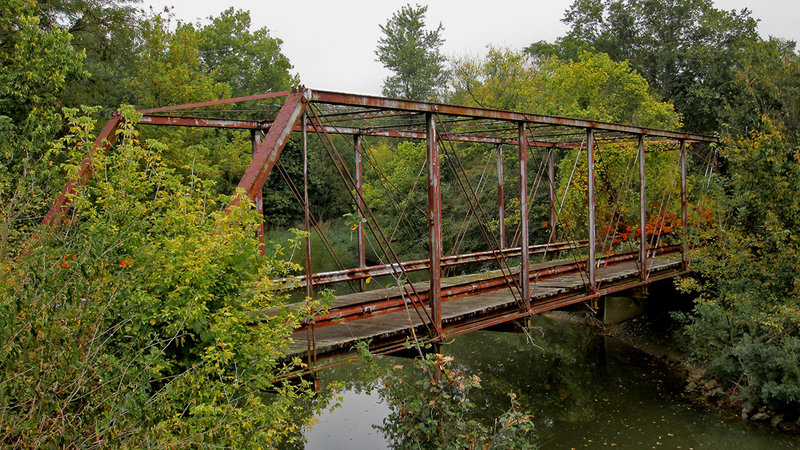 This abandoned bridge, located in Tully Township, crosses the Olentangy River and is visible from Morral-Kirkpatrick Road East. It dates to 1876 and was constructed by the Wrought Iron Bridge Company. 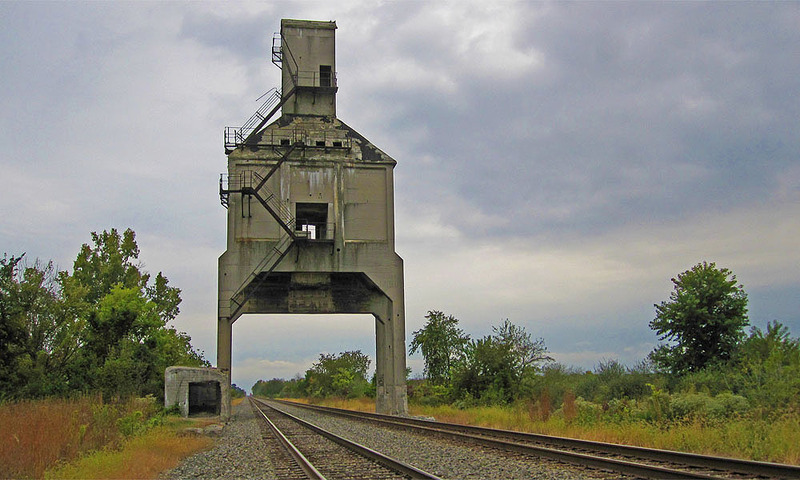 This structure, located near Grandview Estates north of town, is called a coal tipple, and many years ago its purpose was to supply steam locomotives with both coal for their fireboxes and water for the boilers. According to Harry Titus, the structure was saved from demolition when an American eagle nest was discovered in it. In any case, the coal tipple was once a popular hang-out where local teenagers would go to drink and flirt and generally behave recklessly while trains raced below them. For over 100 years Marion Grain and Supply sold livestock feed, field grain, fertilizer and other agricultural goods at its North Vine Street location. Although the business passed through many owners and had different names over the years, it remained in more or less continuous operation until closing its doors in the 1980s. Although the building is not abandoned, it has certainly seen better days. 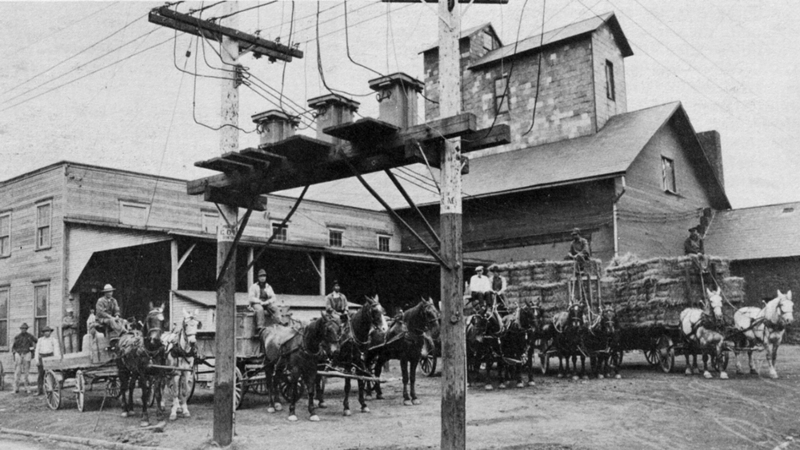 This photo of Marion Grain and Supply, which appears in the Marion County 1979 History, dates from around 1900. 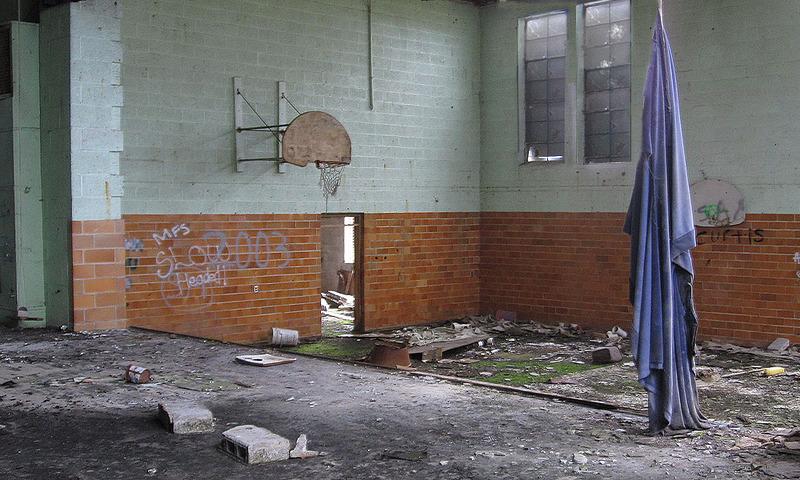 The abandoned Grand Prarire Elementary School out on Marseilles-Galion Road East. Construction began in 1915, and it closed in 1990. 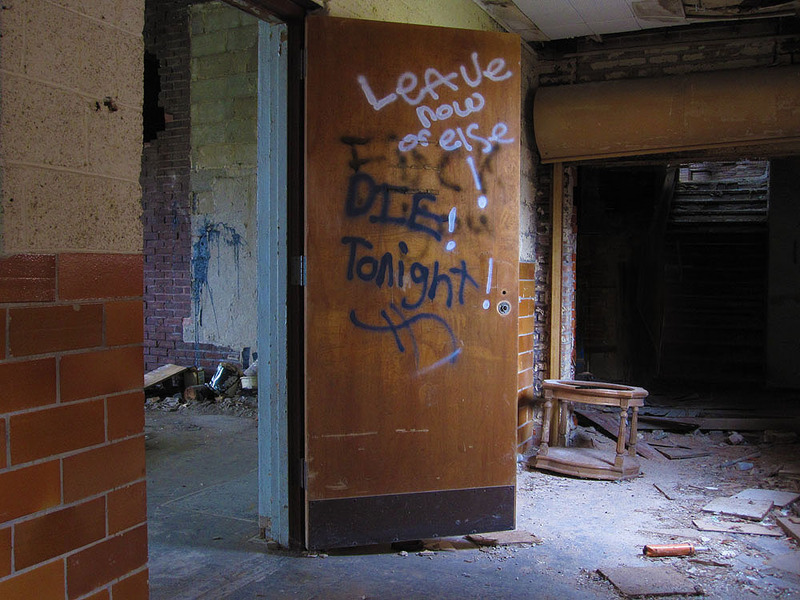 Both vandals and the elements have taken their toll on the school. 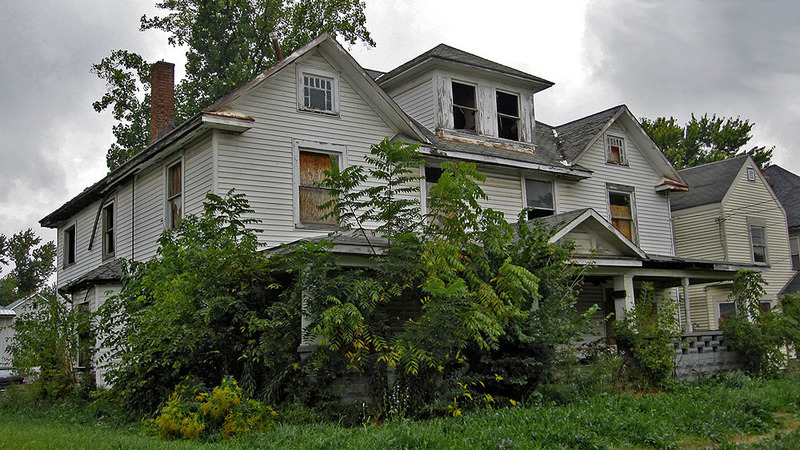 It doesn’t take nature long to have its way with a house once it has been abandoned as the condition of this house on Blaine Avenue proves. 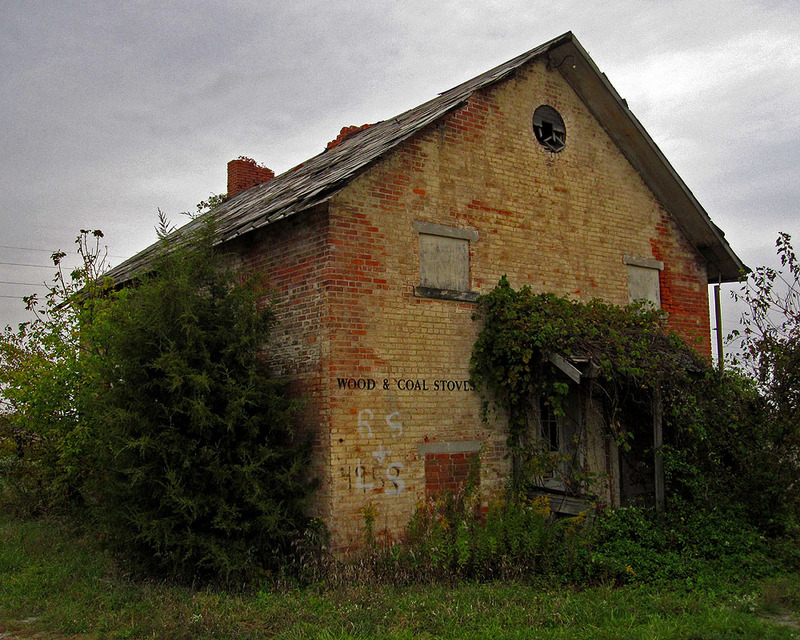 According to Willis Thomas’ book The Schools of Marion County, Ohio, this building, located near the intersection of Marion-Bucyrus Road and Morral-Kirkpatrick Road, was once known as the “Hill School” and dates to at least 1869. 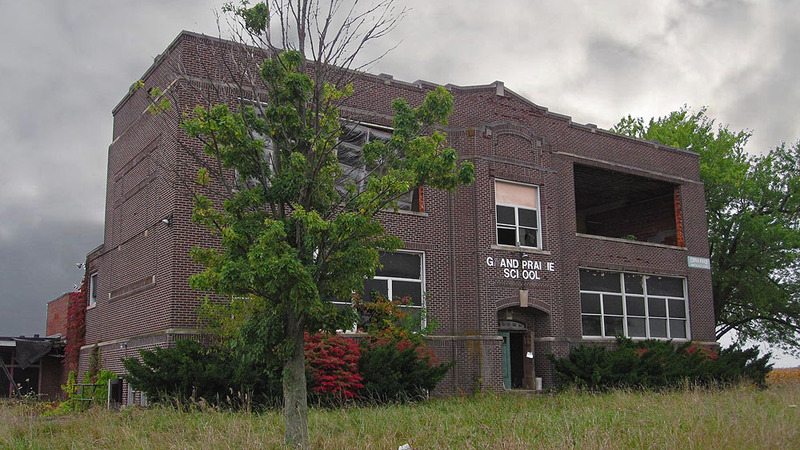 The school was later owned by the Mitchell family, and they ran various businesses (e.g. repairing chainsaws, selling wood-burning stoves) out of it for years. 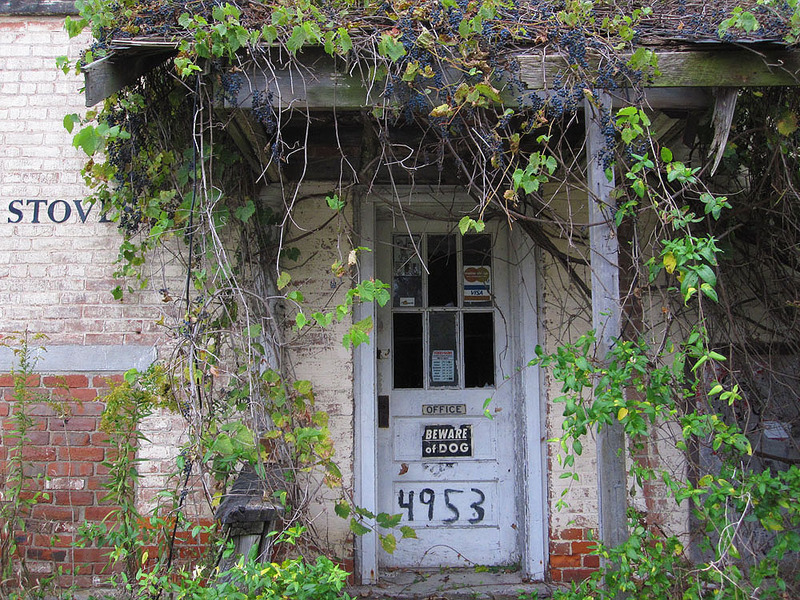 The overgrown front door to the old Mitchell place. Located on the corner of Pole Lane Road and Likens Road, this church, known by many as Likens Chapel, dates to 1917 and replaced the original church that stood at this location. During WWII, the US government took much of the land in that area for the Scioto Ordinance Plant, and the church was forced to close its doors. By 1950, however, church services were once again taking place there. Nevertheless, by the 1980s the congregation had dwindled to such an extent that the church disbanded. Since then, the church has generally stood empty (though at one point a family was using the church as a private residence). 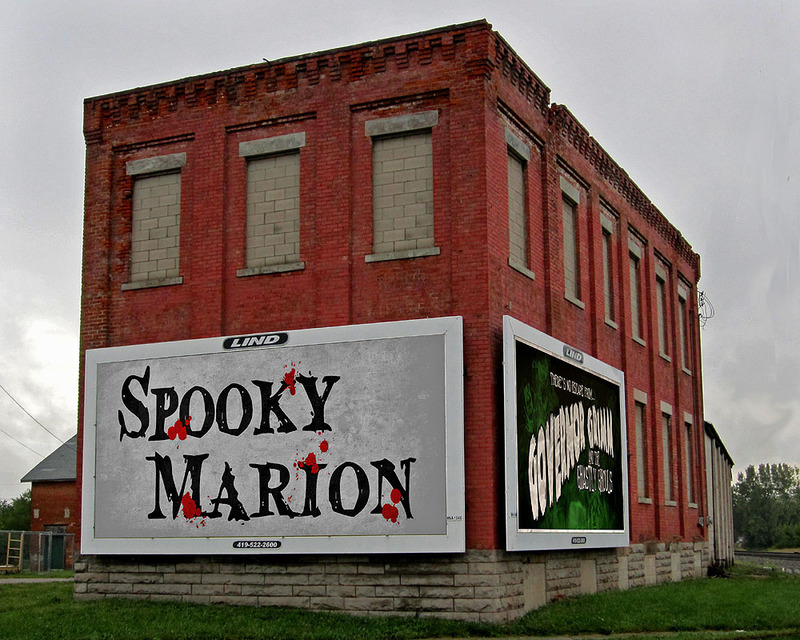 As always, if you find any errors in the above information or would like to add something to it, please drop us a line at spooks@spookymarion.com. Also, we would like to extend a special thank you to the “Growing up in Marion, Ohio” Facebook group whose members were happy to provide information about many of these places. I love this page. It is very interesting to learn about the place I grew up. Thank you !!! I lived across the street from the house on Blaine Ave.
I’m an avid metal detectorist and would love to gain permission to hunt some of these places. Out of curiosity, does anyone have any old photos of the old Ackerman & Lowe piano factory that once stood on the corner of Grand Ave and George St?